Nominal generally refers to pressure treated wood. 4x4 Nominal fits 3.5" x 3.5" up to 3.75" x 3.75"
6x6 Nominal fits 5.5" x 5.5" up to 5.75" x 5.75"
8x8 Nominal fits 7.375" x 7.375" up to 7.625" x 7.625"
Actual generally refers to rough, untreated wood and vinyl or composite posts. 4x4 Actual fits 4" x 4" up to 4.6" x 4.6"
6x6 Actual fits 6" x 6" up to 6.25" x 6.25"
8x8 Actual fits 7.875" x 7.875" up 8.125" x 8.125"
Once you install these decorative post caps, you won't see any screws thanks to our patented SNAP-Cap installation method. We back up the quality of our product with an industry leading 10 year warranty against warping, fading and discoloration. Fits a standard (Nominal) post. (3.5” x 5.5” to 3.875” x 5.875”). These caps slide down the post 1 1/2" and are 5 1/2” x 7 1/2” at their widest point. 10 year guarantee against fading, discoloration and warping! High impact, remarkably sturdy ASA resin. The same material used in automobiles! Quick and easy patented SNAP-CAP installation, built right into the cap! Fraction of the cost of comparable wood caps. Contractor and bulk pricing available! The white 4x6 post caps are part of the Estate Series. These pyramid post caps are made of the same ASA resin as the other fence post toppers in the series. ASA resin is the same material that auto and marine vehicle manufacturers use on their vehicles. We used the material to create a line of fence post caps that we believe are superior to comparable wood products in every way. We guarantee all of our ASA resin post caps against discoloration, fading, and warping for ten years. Our ASA resin fence post caps are UV and impact resistant. They will withstand the rigors of any climate throughout every season of the year. We make all of our post caps in the USA. Our fence post toppers are free from the moisture problems that cause wood to contract and expand. 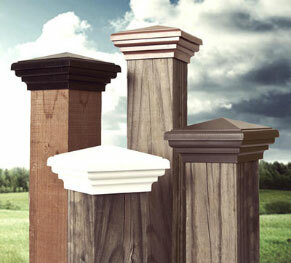 Our ASA resin fence post caps won’t chip, erode or decay because of weather-related, gnawing animal, or insect damage. We sell our products directly to consumers - whether they’re buying a few post caps or buying them in bulk. These fence post caps have a patented SNAP-CAP installation, a feature that makes it easy for you to install the caps without professional assistance. Once they’re installed, you won’t have to worry about any of the maintenance that’s associated with wooden post caps. Our fence post toppers cost far less than wooden caps. The white pyramid 4x6 post caps in the Estate Series are designed to fit nominal posts (boards that measure 3.5 to 5.5-inches or 3.875 to 5.875-inches.) Nominal post toppers fit fence posts whose exact measurements are ½ inch smaller than the size indicated on the label. These 4x6 post caps slide one ½-inch down the post, after which, the post will measure 5 ½ “ x 7 ½ “ at its widest point. Atlanta Post Caps is dedicated to providing old-fashioned customer service, so we offer you a 100% satisfaction guarantee. If you’re not convinced that our fence post caps are the right products for you, we’ll give you a full refund of the purchase price. Subscribe to our newsletter for information on discounts and savings. Licensed contractors, builders and fencing companies receive discounted pricing. All prices are in USD. © 2018 Atlanta Post Caps. Sitemap.